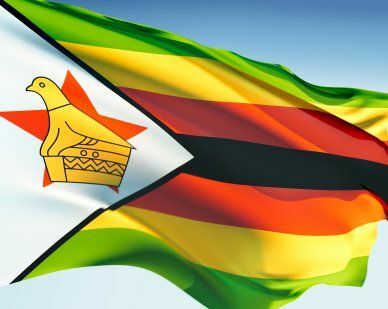 The flag of Zimbabwe was designed by Flight Lieutenant Cedric Herbert in 1979 and featured three horizontal stripes of red, white and green and a vertical black stripe bordered with white on the left side. An emblem of the Zimbabwe bird was pictured in gold. In 1980 it was changed. The flag now has seven horizontal stripes and a white triangle on the left hand side. Within the triangle is a red, five-pointed star with a Zimbabwe bird above it. Our top-quality Zimbabwe flags conform to all official specifications. Emblems and designs are executed with the highest possible degree of accuracy in regard to detail, color shades, placement and proportion to flag size.